Ireland has come top in the inaugural Best Place to do Business in Europe Index, compiled by World First, the international money transfer experts. A combination of a business friendly tax system, easy access to finance and strong economic growth placed Ireland ahead of Slovakia, Latvia and Malta. 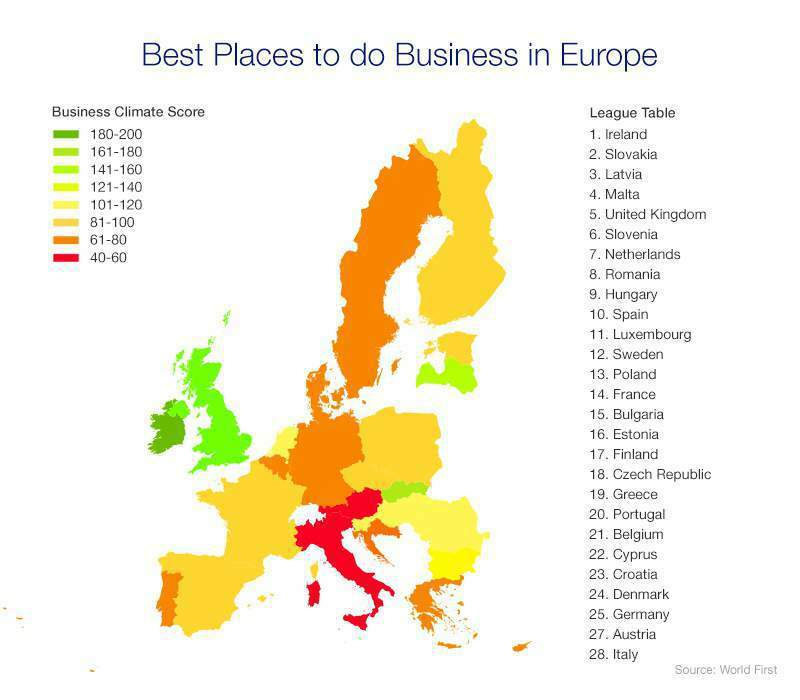 Italy, whose economy has suffered over the past few years, came last in the ranking for businesses looking to expand in Europe. Ireland is regularly cited as a good model for achieving economic recovery post financial crisis. The country’s progressive economic policies has attracted a wealth of foreign investment and seen the likes of Facebook, Google and Microsoft open up local offices and creating thousands of jobs. Ireland is also among the top three for education levels in the EU with over 92% of the population attaining a high school education. Despite the uncertainty caused by the EU referendum, the UK comes 5th on the list of the best place to do business in Europe, beating Spain (10th) France (14th) and Germany (25th). Italy scored last position due to a toxic mix of low economic growth and a pessimistic attitude among private businesses on the availability of funding. The criteria covered a range of economic and demographic evidence including GDP growth, VAT, business birth and death ratios, corporation tax, education levels, tax breaks for SMEs and access to finance. World First’s interactive index, allows businesses to compare which countries ranked highest across each benchmark. All underlying data has been sourced from Eurostat, the World Bank, finance ministries across the EU and respective official domestic statistics agencies. A breakdown of how each country ranks in full across all criteria is available via World First’s interactive tracker. Commenting on the report Edward Hardy, Analyst at World First said: “For any business looking to expand in Europe, the first consideration is how easy it will be to make your business successful in your chosen market. “Our research reveals Ireland as the best place to do business in Europe with new businesses being able to benefit from the Emerald Isle’s growing economy and the business friendly initiatives put in place to assist the private sector. This includes loosening of Ireland’s tax residency requirements and reducing corporation tax to 12.5% which has led to the influx of a number of multinationals already.